A university in London has become the first to roll out its own sports hijab for female Muslim students. Brunel University, which is only one of four in the UK to offer a free sports programme, spotted a gap in the number of women taking part – and in particular those wearing hijabs. A 2017 study by Sport England found that just 18 per cent of Muslim women participate in regular sport, against 30 per cent of the UK’s female population as a whole. Traditionally the hijab, which covers the wearer’s hair and neck, is made from cotton which can quickly become hot, sodden with sweat and uncomfortable when used for sport. But Brunel’s has been made from materials specifically designed to keep the wearer cool while also respecting their religious beliefs. Faith Al Saad, a business management student at the university, said she was “100 per cent confident” the hijab would encourage more of her peers to get into sport. “It’s great; really lightweight, really easy to wear, really comfortable – it feels like you’re wearing nothing on your head which is amazing, especially when doing sports,” said the keen gym-goer. “The traditional hijab is basically a cloth you wrap around your head and then pin down. You can’t really run in it, it’ll literally fly off. The pins come out and it falls off – it’s not comfortable. 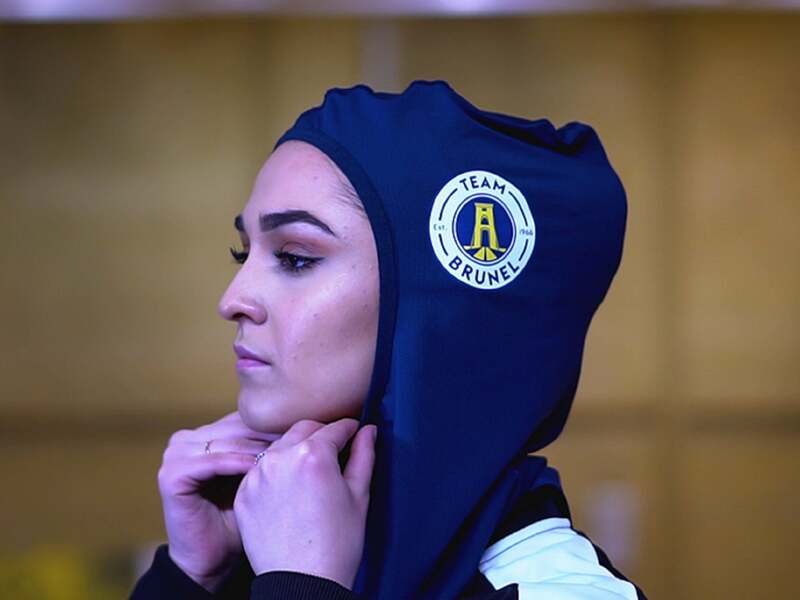 Some sports giants already have their own hijabs on the market, however at £15 Brunel’s is about 40 per cent cheaper than the one Nike launched in 2017. The hijab will initially only be available in “Brunel blue” and in two sizes but it is hoped there will be a wider range of colours if it takes off. Ranjeet Rathore, president of the Union of Brunel Students, has been a driving force behind the hijab. “When we narrowed it down, we found the main gap to be in BAME female sports participation – specifically, we found there to be a barrier to Muslim women taking part in team sport,” he said. “Of course, they were participating in sports on their own and in private, but they weren’t really going out to competitions, or using sport as a social tool to get involved in activities.